After a great night out at PSG on Tuesday, how could I possibly arrange an encore? 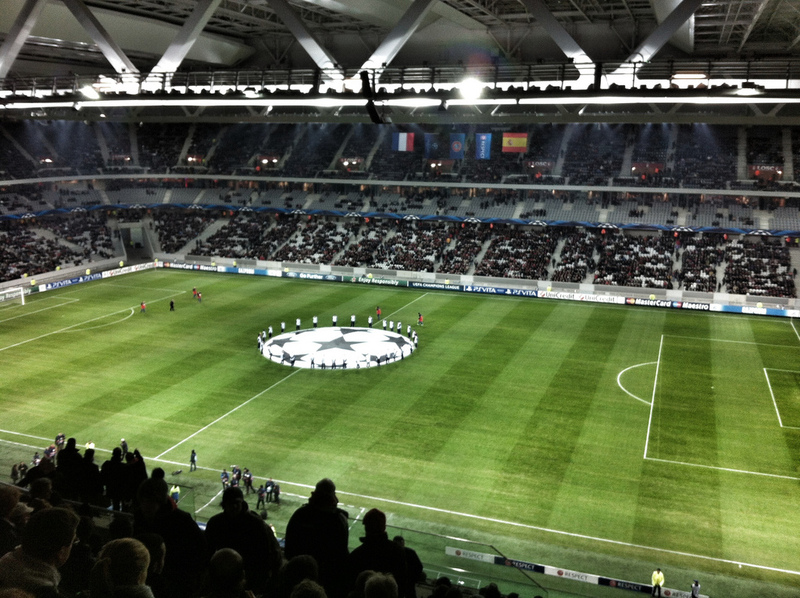 Well how about another slice of Champions League just up the road in Lille? Sigh….if I have to. After seeing just one Champions League gravy train game in nearly two years, two come along within 48 hours. Don’t blame me, blame the Daggers Diary team. They made me do it, it’s all their fault. Did I really have to answer that? Of course not. He had me at “new stadium”. So, Lille then. Or Lille Olympique Sporting Club to give them their fighting name. Domestic double winners in 2011, they had had a traumatic and sometimes nomadic existence since formation in 1944. The fact that they have now got their own big stadium is a reward for the years where they probably felt the powers that be in the city didn’t want a football team at all. In fact this would be the FIFTH home stadium I had seen LOSC play in since 2000. But now they had a stadium fit for a club who have grand ambitions. A 50,186 monster in the Villeneuve-d’Ascq area of the city which UEFA had given a shiny 5 star McDonalds badge. Build it and they will come said the Indian in Waynes World 2, and so far the fans have taken a shine to the Grand Stade Lille Métropole. It did seem that some of the fans though weren’t too happy with the team’s performance in the gravy train this season. 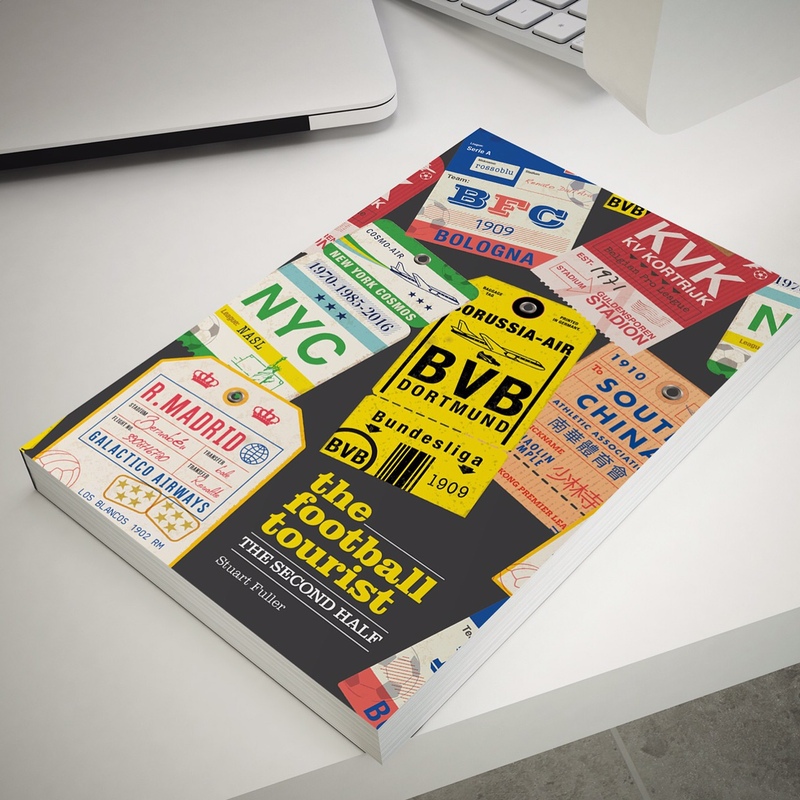 Four defeats in five games prior to the arrival of Valencia including an embarrassing home defeat to the supposedly group whipping boys, BATE Borisov and a 6-1 defeat in Munich had seen the fans fume. Obviously the team lacked that midfield dynamo, the play maker, the fox in the box, the magician since Joe Cole left in May. Oh, and Eden Hazard, son of Mickey, left too. Rumour had it that they would attend the game v Valencia but simply sit in silence. So after a hard day’s work in Paris (including the obligatory long lunch) I headed for the TGV. Fifty minutes later I was heading towards the world-famous Three Brasseurs pub for a few home-brews. 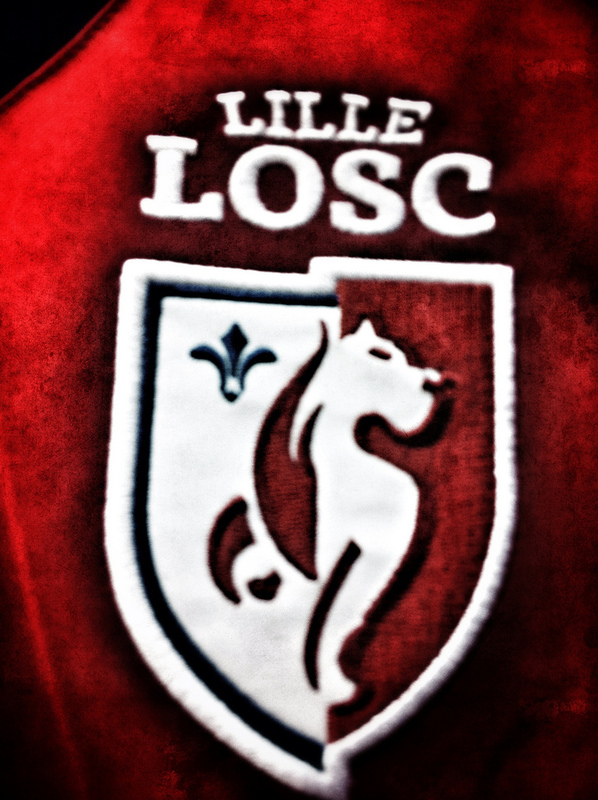 Alas, I was diverted away from temptation by Dan and Brian and taken instead to the LOSC “superstore” in the city centre. I was still on the hunt for a Christmas present for Current Mrs Fuller and lo and behold the perfect present was staring me right in the face. A toaster…but not just any toaster. Sod your Efbe-Schott polka dot toaster – this one not only burnt Lille LOSC on your breakfast BUT played Allez Lille LOSC again and again until you took the toast out. Is that not the best Christmas present EVER? Ipod Mini, Kindle Fire HD, Nexus? 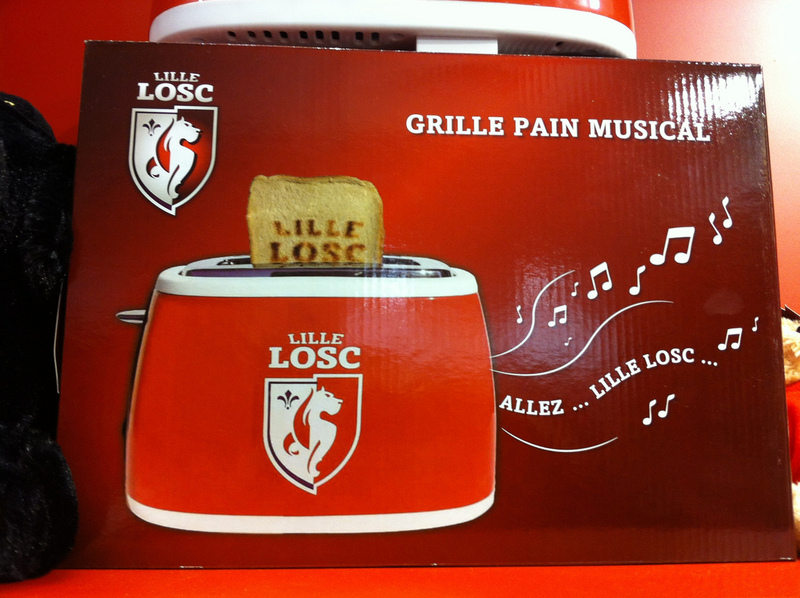 What my wife really wants this Christmas is a musical Lille toaster. Hell, in fact Mariah Carey – this is ALL you want for Christmas. After snapping up every kitchen appliance in the shop we headed down to the stadium. Dan had parked close to the Cantons Metro and after a quick change, we were heading to the stadium. Big tick for having accessible transportation. The plan was to meet a former work colleague, now living the high-life in Lille. Over a beer in the bar outside the ground we heard from Francois about the unhappiness of the LOSC fans who seemed to have it in for the Manager, the Chairman and most of the players. With the weather forecast predicting rain, wind, sleet and snow, the club had taken the decision to close the roof. You would have thought it would be a tad warmer inside than out, but not at all. Bloody freezing. We tried to head down to the edge of the pitch to take a couple of pictures. As we walked down the aisle (bear in mind this was an hour before kick off) our way was blocked by a female steward. So congratulations LOSC for having the rudest stewards in the world. That takes some doing having been to Stoke a few times. We headed upstairs to our seats and watched as slowly the spaces began to fill up. Unfortunately we couldn’t see the screens as the TV gantry was in the way (blocking the view at each end – very impressive). As you can tell by now I wasn’t falling in love with the stadium. It was impressive, but relatively standard – think. 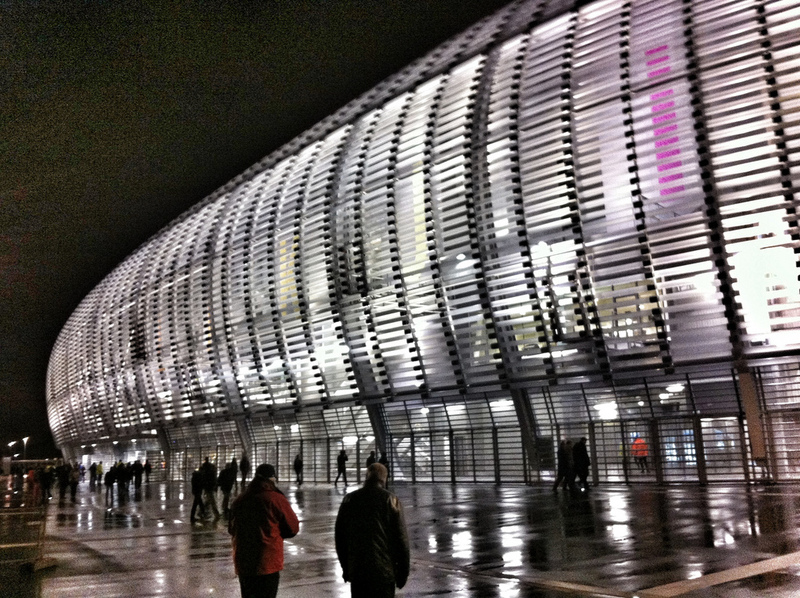 I loved it from the outside, with the exterior made out of light tubes which lit up the Lille sky, but inside it was quite sterile. 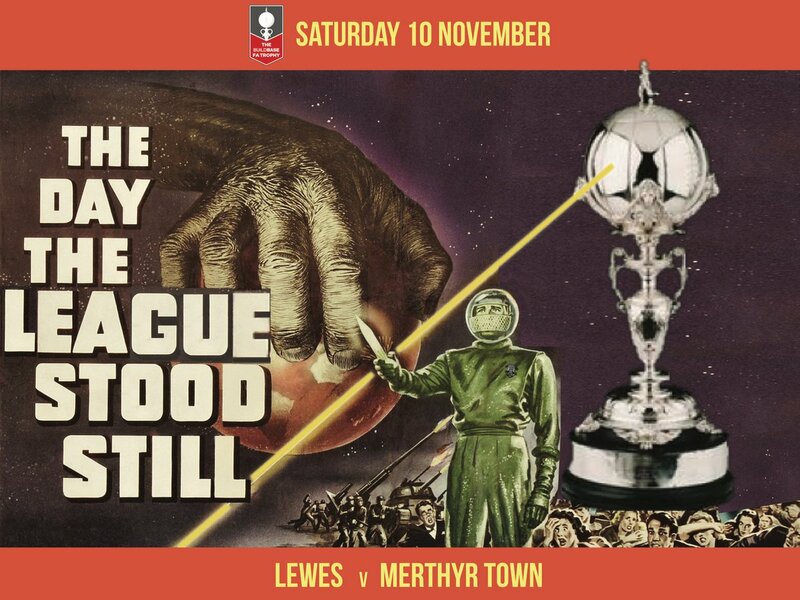 Perhaps it was the complete lack of atmosphere (due to the fan boycott), the rude stewards or the fact it was bloody cold. Hopefully the game would warm me up? As the game petered out, with neither team particularly interested in going forward, the Lille fan next to me turned and said “ils ne sont pas digne de porter la chemise” which I believe means that they (the players and not Brian and Dan sitting next to me) weren’t fit to wear the famous red shirt of LOSC. It had been a toothless performance, played out in almost silence. The 40,000 fans had indeed sat silently, bar for the occasional chant which was met with jeers from the other fans. Unfortunately it had no effect on the team who stumbled through the game without ever really testing the Spaniards. Lille coach Rudi Garcia named young forwards Ronny Rodelin and Gianni Bruno in an experimental lineup and the duo combined in the second minute to create the first chance of the game although Bruno was unable to turn in a cross from the left. Thirty minutes later and the home side had their next chance with little of interest going on in between. Our main excitement was coming from Twitter updates from Stamford Bridge and Sixfield (for betting with Paddy Power outright markets purposes) which was a real disappointment not just for us, but everyone else in the stadium. The only goal of the game came in the 36th minute when Jonas (the fourth Jonas brother, being the black sheep by not following Nick, Joe and Kevin into the music business) converted a penalty after a soft foul had been conceded in the penalty area. At the other end of the pitch, ex-Chelsea player Salomon Kalou went down in the area. In fact Kalou spent most of the game on his bum, obviously having had some private lessons on how to fall over dramatically from Drogba before the two departed from Chelsea. The second half didn’t ever get going although Lille did come more into the game. Valencia needed Bayern to stumble against BATE for them to finish top of the table, but that was never going to happen. Their 73 fans (Dan took a picture of them and then counted them) seemed to be enjoying themselves, knowing that this year a runners-up spot could give them an easier tie in the next round. Full time brought a few boos, although many fans had started departing with around 20 minutes to go. We headed back to the car, tucked into Dan’s girlfriend’s home-made sausage rolls and then I fell asleep. I know how annoying it is to have to drive people home at night and all they do is fall asleep, so sorry Dan. I briefly awoke at Calais when the guy at passport control shone a torch in my face to check I wasn’t an illegal immigrant but then I went back to sleep. It had been a great few days both in terms of work, but also football. I had looked forward to seeing some passion from the fans, especially in the indoor environment, instead I was left feeling very cold. My bets had gone the same way as the evening for Lille, blown in the first half, meaning that I would have to win back my money by Betting on the Premier League weekend games. Nous sommes venus, nous avons vu, nous avons mouillé. This entry was posted in European Football, France, Spain and tagged Champions League, France, Lille, Lille OSC, LOSC, Valencia. Bookmark the permalink.